Rosehaven Cottage: Who walked life's journey in them? When visiting the town of Clovis in California's Central Valley, we always like to pop in to the antique stores in the old town center. There are always some wonderful treasures to enjoy even if we don't buy them. During a visit last year, I had my camera in hand and photographed some of the well-done displays. One had two pair of beautiful antique shoes. I've enjoyed the photograph privately ever since but didn't share it with anyone else because I wasn't quite happy with the photograph. Then today, I decided to play around with my digital art skills. As I perused some of my "second string" photographs for good candidates I came across my shot of the antique shoes. I knew that I wanted to play with it and see if I could make the composition into a piece of art that captured the thoughts I had when I saw the shoes. Every time I have looked at this photograph over the past year, I've found myself reflecting on who must have worn those shoes over the years. What roads have those shoes traveled? Did they carry their wearer through tragedy or triumph? Or both? And now they sit in an antique shoe with price tags hanging on them reflecting prices that can never match the value of a life lived. How can what those shoes have "seen" be summed up in a price tag of $145.00? please ask me and I will be happy to send you a free digital copy. Oh the tales they could tell I bet. Cindy, great shot. I love the montage. How is your back? I ♥ checking out antique stores. So fun to see the stuff they have! Hope you are having an awesome weekend! ♥ Hugs! Ooooooo...pretty! I'd love to have those! I would love to find a really wonderful antiques store and wander (childless) and just take it all in. I love what you did here with your photo. This is a wonderful piece of art. I love how you've taken a second string photo and make it first rate. I love the questions you've raised. Yesterday I was in our local antique mall. And I wonder the same thing as I look at old photos (how did they end up in an anonymous market?) and the clothing and shoes and such. So many memories that could be told, but are silent. My mom had this crazy pair of black shoes like that...always thought of them as witch shoes. Very cute. Everything about them brings to mind a different time...like the fact that I have to replace some shoes every year or so and those are still kickin' around someplace! Crazy. Some things do endure. I like the picture very much. That's cool that you were able to save it, and turn it into something new. I've never thought about old shoes before, until you mentioned these. I wonder who they belonged to? those shoes are so beautiful! I would have loved to have lived in the era they wore those style shoes and I can just imagine the outfits they would have worn with those shoes too. The Disney side of me thought, "the ladies shoes look a bit like the ones that Julie Andrews wore in Mary Poppins". I can understand why you go back to look at the photo! I must have spent about five minutes looking at every detail I could see. And a beautiful piece of art from yourself!! P.S. The poem in the previous post is very inspirational! I love what you did with the photo. Those vintage shoes are wonderful. 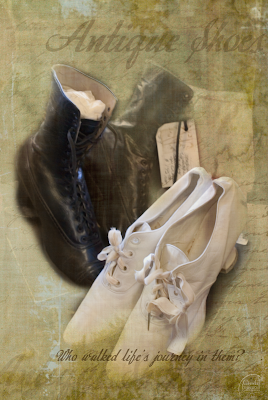 Can you imagine finding a pair of todays shoes in an antique mall years from now? Isn't it great how we can take elements of photos and digitally "remaster" them? Beautiful "vintage" photo you've created here, Cindy!